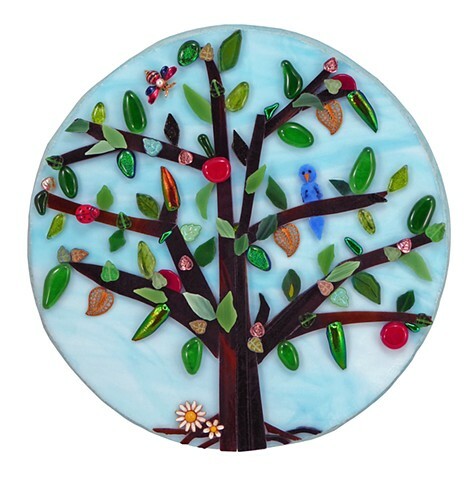 The Tree of Life is a mystical symbol for many cultures. It dates back thousands of years and represents different things to different cultures. For me it represents healing, rejuvenation, strength, and acceptance. “I love glass. I love the play of light as it passes through and reflects off of glass. This love has led me to the art of mosaics creating indoor and outdoor, functional and non-functional works of art. Ever evolving, when I started creating mosaics they were predominately two dimensional and now my mosaics are known for their three dimensional qualities. Creating a mosaic can be a long process. I start with a vague idea, assembling everything I could want to put into the artwork and planning for the engineering that might be necessary. Then I start…finding just the right pieces to make it all come together the way I envision it. Combining glass and beads enhances the texture and rich colors that I love so much, as well as using a great variety of found objects in my artwork. I like to repurpose items, so thrift stores are some of my favorite places to go. Sometimes finding an object, a piece of glass, or a certain shape will inspire and lead me down a totally unexpected path; Piece by piece, putting it all together until the artwork is just right. I am a high school Spanish teacher and split my time between my passions:teaching and creating mosaic art.I belong to the Society of American Mosaic Artists, Contemporary Mosaic Artists, and am the founding member of Full Spectrum Mosaic Artists of Silicon Valley.